Most of all, it [‘intellectual property’] is not inherently “exclusive”. If you trespass on my flat, I can throw you out (exclude you from my home). If you steal my car, I can take it back (exclude you from my car). But once you know my song, once you read my book, once you see my movie, it leaves my control. Short of a round of electroconvulsive therapy, I can’t get you to un-know the sentences you’ve just read here. it’s time to set property aside, time to start recognising that knowledge – valuable, precious, expensive knowledge – isn’t owned. Can’t be owned. The state should regulate our relative interests in the ephemeral realm of thought, but that regulation must be about knowledge, not a clumsy remake of the property system. I do hope we can get there sooner rather than later. Academics – and in particular, academics engaged strongly with new technologies – can and should be in the vanguard here. I used a marked-out equally-spaced grid in masking tape and filmed them moving via video across the grid for an hour. I then reviewed the video and plotted their movements on each minute of the video’s timecode onto a ‘room map’ with corresponsing grid. A real labour of love, and a beautiful and fascinating result. 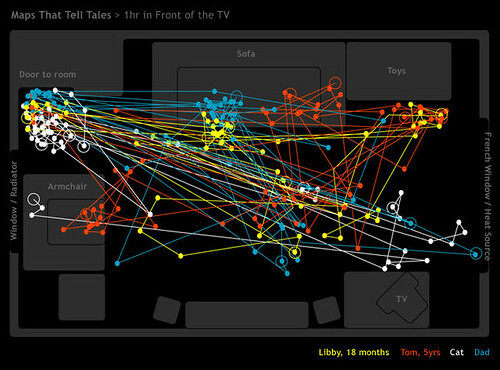 It reminds me of the maps you get from eye-tracking studies of websites. This is exactly the sort of thing I want us to be able to do – without the heavyweight manual data processing – in our shiny new labs, open in April! We can set up the big lab as – say – a living room, and log what goes on when a bunch of users interact with some new technology or other to do a task. Out of the box we’ve only got video capture, but it’s designed specifically to allow it to be kitted out to do this sort of thing – there’s any number of technologies we could use for the tracking. Earlier today [Friday 22nd Feb] the jury handed down its verdict that the patent is valid and that Blackboard should be awarded damages of approximately $3 million. further alienates users from Blackboard and it accelerates the exodus of fair minded educators from the ranks of Blackboard customers. I also hope that John has the resources to continue the fight with an appeal and wish him success if he does. One step back doesn’t mean the journey is doomed, though, and I think it will eventually become clear that this was commercially – as well as ethically – a huge mistake by Blackboard. EDIT: Stephen Downes has a more comprehensive summary of reaction. It’s not terribly positive.